Have you ever used Tibetan mantras? Do you even know what a mantra is? A mantra is intended to protect and calm the mind, so it is a mental protection. A mantra is in fact a series of mystical syllables that invoke the energy of a Buddha or bodhisattva. The repetition of Tibetan mantras in the Vajrayana Buddhism is so important that in esoteric Buddhism it is also called Mantrayana, the Mantra Vehicle. There are also dharanis, longer mantras, and seed syllables (sánsc., Bija) that synthesize the essence of the enlightened mind. The first occurrence of the word mantra is found in the Rig-veda (the oldest text in India, from the middle of the second millennium BC). There it meant ‘instrument of thought’, ‘prayer, request, hymn of adoration, surprising word, song’. According to the Vedic tradition, the ancient sages could hear the subtle vibrations emitted by nature, the breeze, the volcanoes, the thunder, the butterflies, the sea, the rivers and all the energies that were found in nature. They understood that these sounds are the manifestation of the spirit in nature, in matter. They recognized the “Om” as the most elemental sound and that it represented the universal and infinite consciousness. This is why for thousands of years, people have used this mantra to expand their consciousness towards the divine. In Tibetan Buddhism, each mantra is considered to correspond to a certain aspect of the path to enlightenment. It is recited to identify with that aspect of the enlightened mind. Tibetan mantras can be sung in both Sanskrit and Tibetan and each mantra is associated with a quality or a teacher. 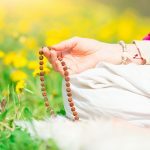 The mantras are repeated with the help of a chin mudra (position of the hands) and with a yapa mala (a type of Tibetan rosary, with 108 beads); this can help the person to enter into a deeper meditation. The mantra can be recited at any time, they can be sung or barely spoken in a low voice, for ourselves. (Pronounced om ma ni pe me jhung) – Means “the jewel in the lotus”. This mantra is to remember that in difficult times we have the opportunity to receive divine “gifts”. It is the best-known mantra and is associated with the Buddha of compassion. (Pronounced goom ganapataiei namaha) – This mantra helps to eliminate all obstacles in any area of life. (Pronounced sat patim dehi paramexeuara) – This is a mantra to give strength to the woman who wants to find the man of her life. (Pronounced naraiani patim dehi xrin clin paramexeuari) – A Tibetan mantra to help the man find the woman of his life. (Pronounced om siri ganechaya namarra om ganecha om) – This mantra is related to the god Ganesha in Hinduism. It is linked to the opening and completion of processes, indicated for those who are initiating a project. (Pronounced om ranumate om) – This is the mantra that brings joy and awakens the pleasure of living. (Pronounced gáte gáte paragáte parasangáte bódíssórra parajina paramita) – This Tibetan mantra can be used to relieve fear and suffering; it brings a sense of comfort in difficult times. (Pronounced om chanti om) – Mantra of peace in Hinduism. It raises the level of consciousness during a meditation and induces the state of deep relaxation when it is repeated many times. (Pronounced om namachiváia) – Tibetan mantra related to the god Shiva in Hinduism. For Tibetan Buddhists it represents the power of consciousness.